THANK YOU FOR YOUR INTEREST IN LEARNING MORE ABOUT OPPORTUNITIES WITH TRUESCHOOL! We tap into the ideas and leadership potential of teachers to transform schools. We believe that those closest to students and communities are best positioned to lead enduring and effective school improvement efforts. Not only must we listen to their voices, but also activate their ideas. By investing in people-powered change in public education, we are driving towards a future in which ALL students achieve and thrive. Over the last 5 years, we have worked with over 2,000 educators in 9 states who have impacted over 100,000 students. For 2018-2019, we received a scale-up grant from the WK Kellogg Foundation and piloted our national fellowship concept in Nebraska and North Carolina. The 164 participating educators have shown substantial increases in collective efficacy — this belief is research-backed as the strongest leading indicator of improvements in student achievement. 95% of TrueSchool Fellows report being supported by their school leadership to question the status quo and try new things to improve student learning. 90% feel encouraged and supported to share what works with other educators. 80% see opportunities for continued growth in their school or district. Find our full impact report HERE. A program and professional learning community for systems leaders who are coordinating this work at the district and state level. As thought partners and influencers, they are the key to scaling this work and its impact. A TrueSchool Micro-Investment Fund for direct investment in schools via a “crowd-investing” approach: decision-making is distributed and educators and community members serve as the investors. A multi-year impact measurement approach and university partnership, including ongoing research of the impact of the innovative learning models over a 3 year period (e.g. gains in student achievement, reduction of equity gaps) as well as the program’s impact on systems (e.g. teacher retention, leadership pipelines, etc). A digital tool and showcase of schools achieving great results for students. By open-sourcing the TrueSchool Blueprints created by school teams via a user-friendly digital tool, we can encourage educators elsewhere to replicate and adapt what’s showing results for students! We also want to put educators front-and-center as innovators and thought-leaders. This will inform, inspire, and activate other schools across the state and country! Application numbers for the fellowship double every year, resulting in 300+ schools submitting a vision for school improvement and innovation that is co-created with district leadership. This in and of itself has an impact, with schools teams incentivized to prepare a vision for innovation in the years ahead and to build district buy-in to support that vision –without even participating in the program yet. The spark of our comprehensive outreach, awareness-building, and application process provides a direct benefit as schools work through this initial planning. “Crowd-Invest” $240,000+ in the most transformational schools in the state, further catalyzing their work and solidifying their impact. Educators and community members are the investors! The decision-making process is distributed across the TrueSchool community of educators and supporters, thereby enhancing recognition of schools and spreading the knowledge of what they have built! A critical mass of districts has been reached (30%+). They are enhancing the freedoms and flexibilities for schools, offering more teacher leadership opportunities, and increasing levels of teacher satisfaction + retention. 40+ local TrueSchool Coaches are certified and now developing others, ensuring the process “sticks,” the work at the school-level is supported, and enduring impact is achieved. 300+ innovative education leaders are connected to a unique learning community across the state. 20+ “bright spot” schools are showcased and serve as outstanding models of educator-led efforts that are dramatically improving equity, academic achievement, and social-emotional support for students. These “pockets of greatness” are no longer isolated, but now inspire and inform other educators across the state and country. Be at the forefront of this effort and join us as a TrueSchool Lead Impact Investor by contributing to our goal of raising of $300,000 by June 30, 2019. Contribute specifically to the TrueSchool Micro-Investment Fund. 100% of this money goes directly to schools and investment decisions are made by educators and community members. If you contribute by May 6, you can still fund the 2018-2019 TrueSchool Teams! We currently have $20,000 raised for TrueSchool Teams this year. We are aiming to raise a total of $50,000. Help us hit this goal and invest in their great work! 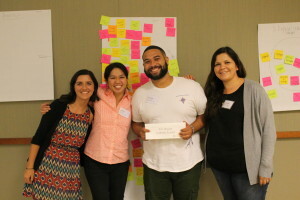 Connect us to others who may be interested in contributing, whether through thought partnership, awareness-building, outreach to districts and schools to apply, becoming a TrueSchool Coach, direct investment, or referrals to others who might contribute!